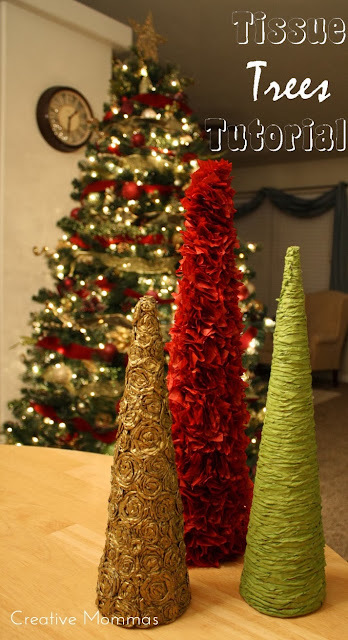 Make tree forms with cups and cardstock. Just make a cone out of cardstock, place it on top of the cup & tape it to the rim of the cup. 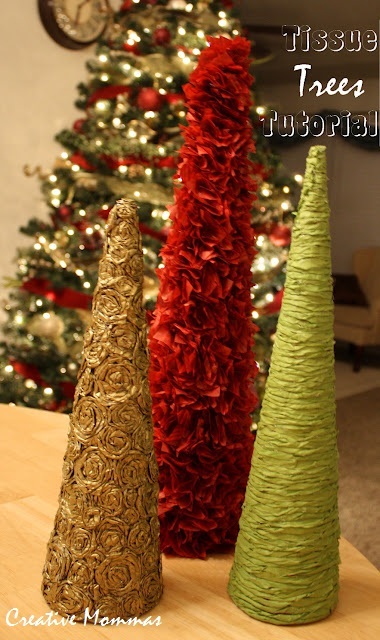 I wanted mine to be 3 different sizes, so I just added a second cone on top of the first, to make it taller. 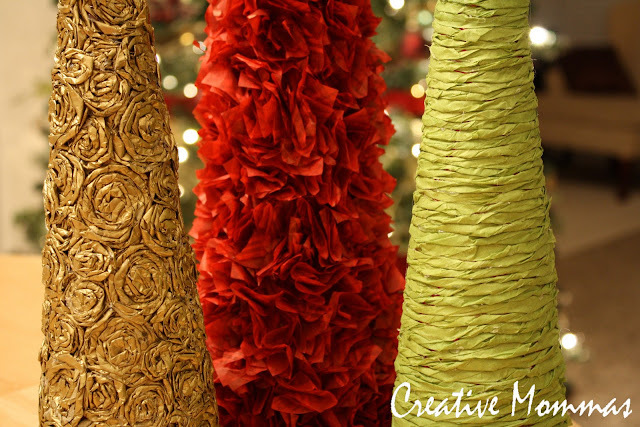 To make the rosette tissue tree I cut strips of tissue paper approx. 1.5" thick. I bought a pack of shiny gold tissue paper at Walmart for $1.00. Then I twisted them into rosettes and used hot glue to keep the shape. I made different sizes of rosettes to change it up a bit and to fit in all the cracks where red was peeking through. The red tissue tree didn't take as long to make, but it was still pretty time consuming. I cut 1.5" x 1.5" squares & that was pretty easy with my rotary cutter. For instructions on this tree, go here to Spunky Junky Blog. These two were lonely on the counter for days because I was kinda burnt out on making them. Just yesterday I got the idea of how I wanted to make my third tree. I knew it was going to be green to go with my other decor and I knew I wanted it to be different from the other two trees. I cut 1.5" strips and twisted them just like I did for my rosettes. Then I simply hot glued them onto the tree shape in rows. This is also similar to trees that are made of yarn and such. I didn't go around the tree like a continuous strip, so I kind of have this cool design on the back from where the "seam" is (at least it looks like a seam). I really do love the end result, but I will warn you again that these are not quick crafts. Thanks Spunky Junky for the idea and the rest of the Internet for the inspiration! !